The A-150-RG Wheeled Fire Extinguisher is a pressure regulated monoammonium phosphate agent extinguisher that is rechargeable. Designed for one-man operation for easy transport through doorways, around corners and into hard to reach places. The chemical agent can extinguish Class A, Class B and/or Class C fires. The Buckeye A-150-RG can be fitted with a tow loops for easy transport by any vehicle with hitch. Additionally, the Buckeye A-150-RG can be modified to a stationary unit. Wheeled fire extinguishers, such as the Buckeye A-150-RG, can be found at construction sites, chemical plants, warehouses, commercial buildings, loading docks, storage units, or any other building, business or area where a more large-scale fire may occur. The Buckeye A-150-RG has an agent capacity of 125lb. The extinguisher uses a monoammonium phosphate-based agent which is ideal for Class A, Class B, and Class C fires. A = Class A fire and the amount of chemicals/agent in the wheeled fire extinguisher equivalent to the amount of water the extinguisher holds equal to 1.25 gallons of water. The number 30 that precedes the class fire letter A is the number of equivalents. Therefore, the 30A equates to 37.5 gallons of water extinguishing capability (30 x 1.25 = 37.5). B = The number 240 that precedes the letters B:C is the number of square feet that the extinguisher can cover or is able to extinguish. Therefore, a 240B equates to being able to extinguish 240 square feet of a Class B fire. Note: While the Buckeye A-150-RG can be used on Class C fires, It should not be used on sensitive electrical equipment as the agent may damage the equipment. 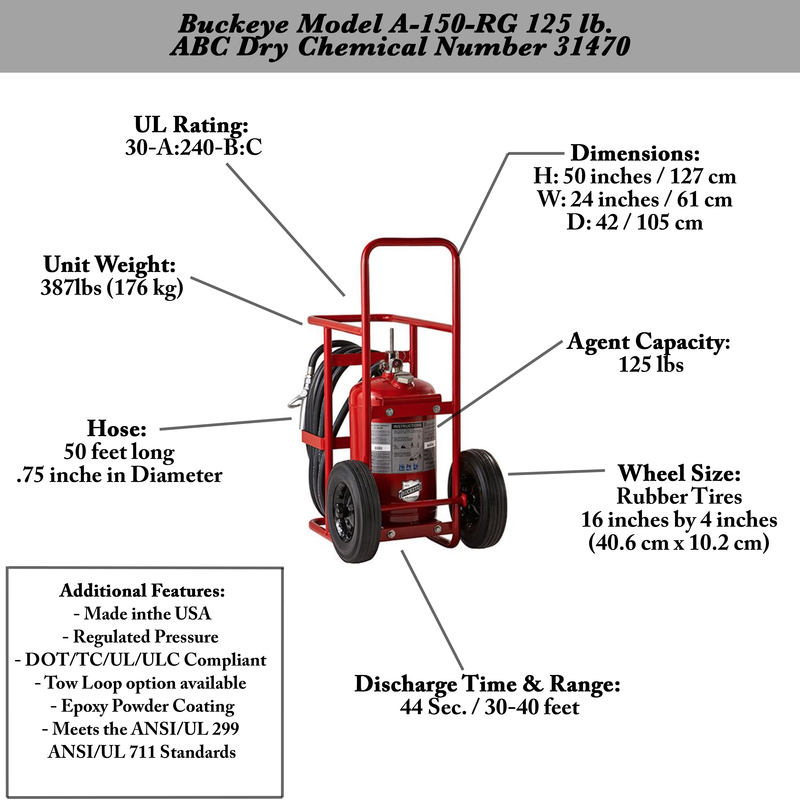 The Buckeye A-150-RG is an ABC Dry Chemical fire extinguisher. The Buckeye A-150-RG has a discharge time of 44 seconds of continual spray and a range of 30-40 feet, depending on environmental conditions such as the wind, temperature, or humidity. The Buckeye A-150-RG weighs a total of 387 lbs (176 kg). The Buckeye A-150-RG is 50 inches (127 cm) in height, 24 inches (61 cm) in width, and 42 inches (105 cm) in depth. The Buckeye A-150-RG comes fitted with a 50-foot hose and is .75 inches in diameter. 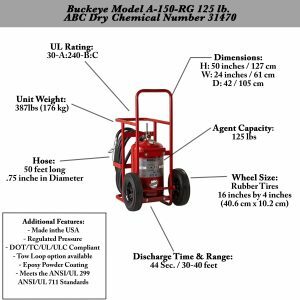 The Buckeye A-150-RG comes with Semi-pneumatic rubber wheels that are 16 inches (40.6 cm) by 4 inches (10.2 cm). Is there a smaller ABC Wheeled Fire Extinguisher available? Yes. The A-150-RG with 125 lb agent capacity is larger than the following wheeled ABC fire extinguishers. Can the Buckeye A-150-RG be used on oil rigs or boat docks? The Buckeye A-150-RG fire extinguishers can be used offshore on oil rigs or along the coastline. However, where harsh weather environmental conditions exist, rust or damage to the fire extinguisher can occur. Therefore, it is recommended that an offshore fire extinguisher be used. Offshore fire extinguishers are coated with extra layers of galvanized compound to prevent rust and corrosion that may occur. Can the Buckeye A-150-RG be used on sensitive electrical equipment? No. Only fire extinguishers that use a residue-free extinguishing agent, that is suitable for sensitive electrical equipment. The two clean agent fire extinguisher types are Carbon Dioxide and Halotron I.